Home › Insight › What is a circular economy? Few manufacturers are currently willing or able to recover and repurpose their products at the end of their life – and even fewer design them with reusability in mind. In addition, many existing recycling solutions serve only to displace unwanted waste materials elsewhere. Plastic waste has become one of the most visible signs of this inability to close the loop on the cycle of production and consumption: of the 8.3 billion tonnes of plastic produced since the early 1950s, approximately 6.3 billion tonnes has become waste. A circular economic model seeks to close that loop. It is not simply about finding new uses for materials ordinarily viewed as waste, but instead seeks to ‘design out’ waste and resource dependence in the first place. This might involve creating modular products that can be easily repaired, upgraded or dismantled at end of life – helping to preserve the value and usefulness of products and materials for as long as possible. Or it could see a shift from companies selling products to leasing them to consumers, thereby encouraging manufacturers to improve performance, minimise lifecycle costs and extend product lifetimes. In the context of existing services, one example might be the rise in car clubs or car-sharing services, reducing the need for individual car ownership. For the car club operator, renting a single car to multiple users increases revenues per unit. As fuel is often included in the subscription fee, car club operators are also incentivised to offer more efficient vehicles to maximise profits. The circular economy also involves thinking about the way in which products are made. For example, powering production processes with renewable energy and working to regenerate, rather than extract from, natural systems. Moving to a circular economy will require a systemic shift towards an approach that's more sensitive to and reflective of natural, living systems. Organisations will have to consider not only how they can minimise their negative impacts, but also how their activities can build long-term environmental resilience. This shift is likely to create new business opportunities, while providing lasting ecological and social benefits. The advantages of moving towards a more circular economy are clear: waste volumes and greenhouse gas emissions would fall, as would our dependence on the extraction of large quantities of raw materials, enabling ecosystems to recover. The business case for a circular economy is also compelling. A 2015 study by Accenture suggested up to $4.5 trillion in global economic value could be generated by 2030 if businesses adopted more circular models. 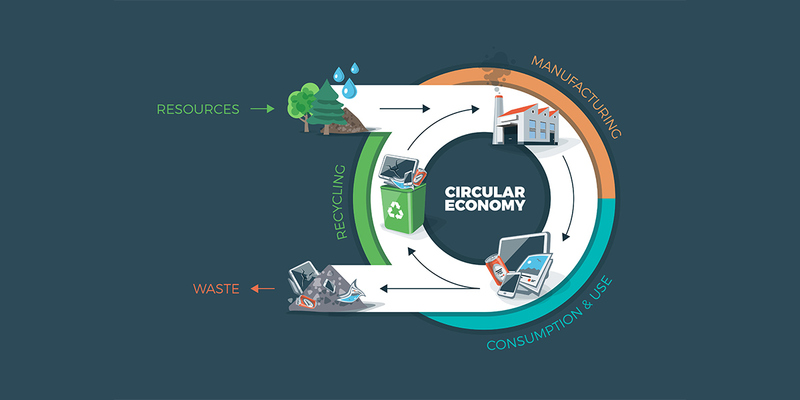 Another study released in the same year by the Ellen MacArthur Foundation looked at the benefits of circular economy approaches within Europe. This found the potential for resource productivity to grow by up to 3% annually, significantly boosting GDP growth relative to business as usual. In 2017, the World Business Council for Sustainable Development (WBCSD) published “8 Business Cases for The Circular Economy”. This highlighted how companies could use a circular economic model to differentiate themselves from their competitors, reduce operating costs, and improve customer and employee loyalty. Additional benefits identified in a 2014 World Economic Forum report include annual savings of over $1 trillion from reduced material usage alone, in addition to significant potential for job creation in resource recovery and remanufacturing. The report also argued that a more circular economy could help mitigate against supply risk and price volatility, and reduce the huge annual cost of biodiversity loss. It is therefore clear that companies adopting circular business models are likely to enjoy greater competitive advantages and opportunities for growth in the future. As investors, we recognise the long-term investment opportunities that the circular economy presents and look to identify leading companies that will benefit as a result. We can also support circular economy initiatives and encourage companies to design out waste and reduce their dependence on non-renewable resources. Identifying opportunities for durable value generation through investment, while encouraging positive steps towards a more sustainable and less wasteful future is clearly a win-win situation.